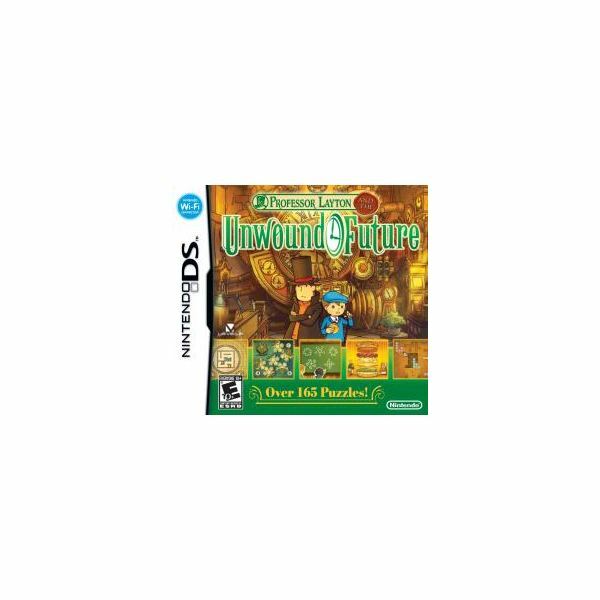 Professor Layton And The Unwound Future is the third entry in the popular Professor Layton series for the Nintendo DS handheld system. As with its predecessors, the objective is to solve a mystery you’ve been plunged into the middle of by exploring your surroundings and solving smaller puzzles along the way. There are 168 puzzles in total, as well as three minigames to offer plenty to complete for anyone. There’s a new setting and a new mystery with brand new characters, and plenty of interactions with series regulars along the way. So how does Professor Layton’s newest entry compare to the previous entries in the series? This is the most important part of any Professor Layton game. It’s where every Professor Layton game has always shone, and it’s also where Professor Layton And The Unwound Future is leagues ahead of its predecessors. The puzzles have always been good; they’re the reason the games were ever successful to begin with. The puzzles in this third entry, however, are always that extra step better. There’s a wonderful variety of types of puzzles, so if there’s a kind of puzzle you don’t like, it’s almost always a guarantee that the next puzzle will be different. There’s a nice handful of clever trick questions that will make you want to slap your forehead when you finally figure them out. There are some easy puzzle that you’ll barely even need to think about, and some frustratingly difficult ones that will have you wracking your brain endlessly to get to the bottom of them. When you do come across an exceptionally difficult puzzle, as always with series, you can purchase hints to help you solve the puzzle in tiers. There are three hints, as there have always been, that cost one hint coin each, and offer a better hint with each tier. Now, however, they’ve added a fourth "super hint" which costs two hint coins and gives you enough of a hand to help you solve just about anything. This is great for those puzzles that you absolutely can’t wrap your head around no matter what. As always, offering the hints in tiers lets you do the real solving. You can ask for just as much help as you need instead of asking for the answer so you can still feel like you accomplished it. And of course, hint coins are limited, so since you can’t afford to buy all the hints for everything, you’ll be motivated to try to use them sparingly. There are 168 puzzles to solve, not counting the mini-games. And, in addition to those, there are new puzzles added every week for download via the Nintendo wi-fi connection. Yes, some of them are better than others. Mostly, however, they are brilliant, and will keep you coming back to the game for more. 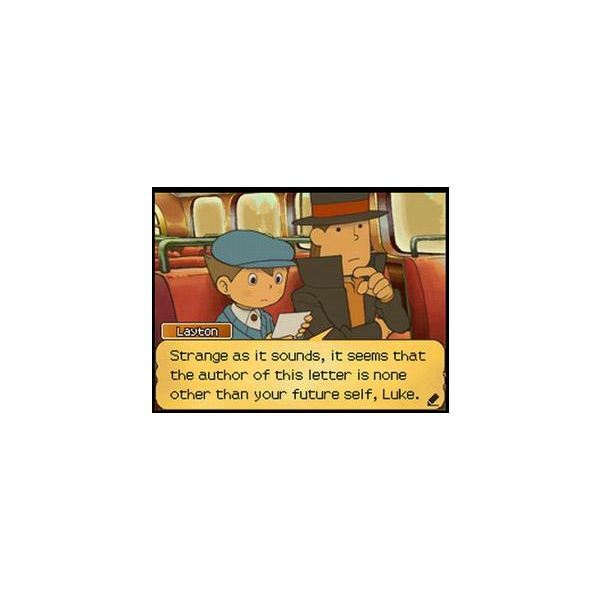 In terms of the visual and audio aspect, Professor Layton And The Unwound Future doesn’t differ greatly from its two predecessors. The game looks more or less like the series always has, which is not a bad thing. The graphics may not be pushing the DS to its limits, but that was never really the intent with any of the entries in the series, and the art style is the same familiar art style they’ve developed with the first two games. Professor Layton has always had a very simple aesthetic that, while it may not do anything to overwhelm, serves its purpose with an almost nostalgic cartoon palette. The music in this Professor Layton doesn’t seem to surpass previous installments either; it’s never annoying but never memorable. It generally does serve reasonably well to compliment the mood of an area you might be exploring or a puzzle you’re working on solving, but the composition doesn’t seem to be an area where the makers of the games have ever spent a lot of time or effort. The voice acting, however, an area where so many games fall short, is one area where the Professor Layton games have always shone, and this time around, they not only continues that tradition but expand upon it. All the major characters are voiced by the same actors they always have been, some new characters are given voices, and the amount of voice acting in total is greatly expanded upon. Overall, the voice-acted portions contribute greatly to the immersion of the game’s story. Speaking of the story, it does an excellent job of taking the formula they’ve created so far with the series to new heights. This game, as with the first two entries in the series, follows a basic set of rules with its story. It starts out with a large mystery, and as the titular Professor and his self-styled apprentice Luke delve deeper into uncovering the mystery, it becomes stranger and more impossible at every turn, before wrapping itself up at the end with a couple of handy plot twists. Think of it as a light-hearted take on a Sherlock Holmes-esque mystery. The mystery this time around revolves around a botched time travel demonstration at the onset of the game that results in England’s Prime Minister going missing, followed by Luke and the Professor seemingly being catapulted forward in time by ten years, and things grow more unbelievable at every step. The writers keep things shrouded enough that figuring everything out before the end is nearly impossible, and light-hearted enough that it’s still a fun romp at every turn. The puzzles are obviously the major draw for a Professor Layton game, and the story is far from perfect, but it does a decent job of carrying you from one puzzle to the next and staying fun while it does it. The gameplay itself follows a pretty simple mechanic. Using the touch screen, you move from screen to screen to explore areas in an effort to uncover the mysteries you’re investigating. You tap on objects or people to interact with them. Some objects will yield hint coins which you can use to purchase hints in the trickier puzzles you come across. Others will simply elicit a comment on screen from the game’s heroes, just as some people you talk to may only have a small piece of dialogue to offer. Many will, of course, result in puzzles being found for you to solve, but its nice to have something happen when there’s no puzzle to be had, even if it’s little more than small talk, to make the scenery of the game feel more complete. The game will always offer a primary objective you should move towards, but it’s up to you to explore as much as you’d like along your way. Exploring will earn you many additional hint coins and puzzles. Should you leave them behind, however, puzzles always remain available at their original place unless the game’s story has made them unattainable there, in which case they’re moved to a central location where you can go to solve them at your leisure. It’s impossible to "miss" a puzzle accidentally and never be able to get back to it, so you can complete as much of the game as you want to without ever having to worry about closing something off to yourself. Of course, it’s the puzzles you’re ultimately looking for, and when they do come up, you solve them and move forward. If you can’t figure out the solution and you want to explore somewhere else in the meantime, you can always exit a puzzle and come back later. There are a handful of puzzles triggered by the story that must be solved to move forward, but most can be solved later or skipped entirely. The game will stop you in a couple places as well to check the number of puzzles you’ve solved in total, and will stop you from advancing until you’ve solved a certain number, so there is a minimum you must solve by the end of the game, but it’s fewer than 100 of the 168 total puzzles the game has to offer, which is nice for those players that may not be concerned with completing 100% and want to advance without solving a handful of the more frustrating puzzles. There are three types of minigames as well, which are really just different types of puzzles to add even more for you to solve. They are fun, however, and offer a nice occasional distraction from the main game. As well, all three of them offer greater challenges as you advance in them, and to unlock those greater challenges, you must often earn them as rewards for solving puzzles within the game, which offers a nice two-way incentive for those players that do like to complete 100%. The controls in a Professor Layton title have always been pretty simple, and Professor Layton And The Unwound Future is no exception. You use the touch screen to tap on where you want to move, what you want to interact with, and to solve puzzles, you tap, circle, or drag objects, or you write numbers and/or letters. As long as you have a DS with a functioning touch screen, it is an extremely easy and intuitive game to control. The gameplay and menu interfaces are easy to understand and easy to use as well. These are games that are primarily about solving their puzzles, and the job of the interface is to serve as a fun and user-friendly way to guide you between the puzzles. It’s the presentation aspect, so it’s at its best when its kept simple and easy to use. The interface is never going to astonish you, but it will work for you almost without you noticing it so it never gets in the way of you enjoying the game. Professor Layton And The Unwound Future is a great game. 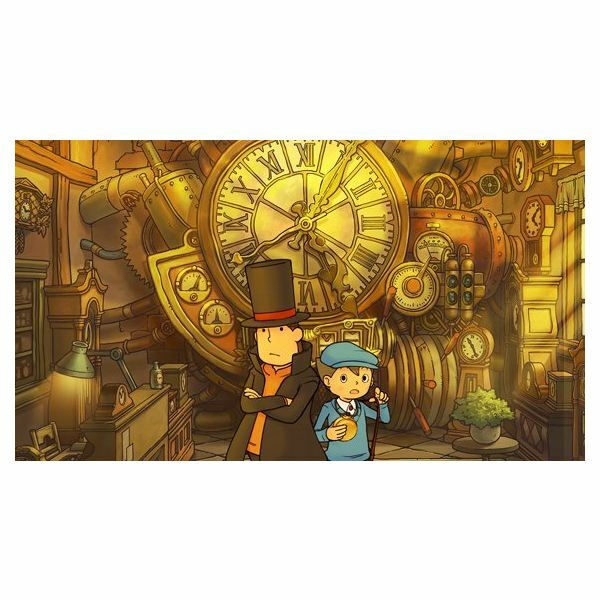 Following the acts of Professor Layton and the Curious Village and Professor Layton and the Diabolical Box is a tough job, but this series continues to get better with each installment, and its third entry appears to be nearing perfection of the formula. It’s easily good for 10-20 hours of gameplay, depending on how many of the puzzles you decide to solve. It forces you to think, and it offers that feeling of having triumphed that’s such a driving force in the enjoyment of any game literally hundreds of times by having so many puzzles. Also, by splitting the game into such small pieces as those individual puzzles, it becomes something that is incredibly portable, even more so than many other games offered for the DS. If you want something for that train ride to work or your lunch break, or even maybe the dentist’s waiting room, it’s a game you can easily play for 10 or 20 minutes and still advance. And, because there are so many puzzles, it’s still not a game that will be over right away. Each game also links to the previous entry by way of a code so that if you own all three you get access to a couple extra puzzles and some neat things like concept art. It’s a nice easter egg for those players who want to get all the entries in the series. Overall, if you’re looking for something fun to do with your DS and you like letting your mind work a little bit, Professor Layton And The Unwound Future is exactly the sort of gaming experience the DS is perfect for, and while it may not be perfect in every way, it is always fun. I would feel comfortable recommendiing it to almost anyone.